A heartfelt picture book attempts to address the stories of foster children. 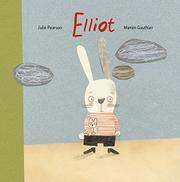 The cast of characters is made up of anthropomorphic rabbits rendered in flat, mixed-media collage, and the protagonist, Elliot, is “a playful little boy who was full of life.” He’s introduced in a warm embrace with his parents, who “loved him very much.” Over two page turns, readers see Elliot alone, crying, then yelling, then misbehaving, and the text tells them that his parents don’t understand, don’t know what to do, and don’t know how to react. They seek help, and “Thomas came to visit.” He’s presumably a social worker, introduced in an alarming juxtaposition of a benign illustration of everyone seated at a table with text that reads, “He said he would take Elliot to stay with another family until his parents learned how to take better care of him.” Elliot’s life changes drastically. He moves back and forth between (good) foster homes and his parents, finally ending up in an adoptive family. Both text and art are careful to depict his conflicted, difficult feelings, but they take far less care in depictions of the characters and their circumstances. The story is simply too restrained in depicting the crises that precipitate Elliot’s placement into foster care, and they therefore risk minimizing the tragedy—and even spiking anxiety—as they attempt to offer hope.